iPod Touch is regarded as simplified iPhone as it can do almost anything that iPhone can do, except for calling and using celluar data when there is no WIFI connection outside. However, Apple doesn't upgrade iPod Touch as frequently as iPhone. As of May 2018, the latest generation of iPhone is iPhone X while iPod Touch is 6th. For Apple Music, only iPod Touch 5th and 6th are supported. If you have an iPod Touch 4 or an older generation model and want to enjoy Apple Music on it, you need to convert Apple Music to MP3 or M4A with Apple Music Converter first. Apple has released 10th generation of iPhone, which calls iPhone X, however, the latest generation of iPod Touch still remains at 6th generation which was released on July 15, 2015. That is to say, iPod Touch hasn't been upgraded for near 3 years. Some iPod lovers are worrying whether Apple will discontinue iPod Touch in a near future as Apple has discontinued iPod Classic on September 9, 2014 and discontinued iPod Nano and iPod Shuffle on Jul 27, 2017. In the product line of iPod, only iPod Touch comes with iOS system and can be used to install apps from App Store, and it's also the only type of iPod which can be used to listen to Apple Music. However, as to iOS devices, Apple Music requires iOS 8.4 or later versions, and only iPod Touch 5 and iPod Touch 6 can meet the requirements. The latest iOS version for iPod Touch 4 is iOS 6.1.6 which means you can't enjoy Apple Music on iPod Touch 4 or older generations. If you tried to sync Apple Music songs in iTunes to an iPod Touch 4, you will get the same error message that "Apple Music songs cannot be copied to an iPod". Some users who have subscribed Apple Music asked for help on Apple Community, but the only answer is that "Apple Music is not available on iPod Touch 4". However, that doesn't mean there is no way to enjoy Apple Music songs on iPod Touch 4. If you have got Apple Music Converter, the problems will be smoothly solved. TuneMobie Apple Music Converter is a dedicated Apple Music DRM removal program which can remove DRM protection from Apple Music songs and convert them to unprotected audio formats like MP3, M4A, AC3, AU, AIFF, FLAC and MKA. For all generations of iPod Touch, MP3 and M4A are supported audio formats. 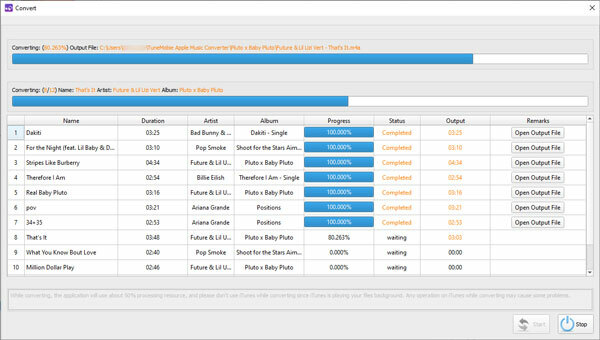 TuneMobie Apple Music Converter will preserve all ID3 tags including song title, album, artist, genre, track number, artwork, etc. in the output MP3 and M4A. And depending on your need, you can preserve 100% original audio quality or make file size smaller by setting a lower quality. What is more, Apple Music Converter allows you to sort and rename output files in bulk by supported ID3 tags and characters. Besides, Apple Music Converter performs at 16X faster conversion speed which can convert Apple Music songs in an incredibly fast speed and save you a lot of time. Apple Music Converter is available for both Windows and Mac platform, and it's fully compatible with latest Windows 10 and macOS Mojave. When using Windows version, you can even convert Apple Music songs directly online without downloading to iTunes library, just simply add the songs to iTunes library first. Apple Music Converter is extremely easy-to-use, follow the steps below to convert Apple Music to MP3 or M4A for your iPod Touch. Launch TuneMobie Apple Music Converter and iTunes will be opened automatically as well. The converter will load iTunes media library and list them as playlists in the left panel of software interface. There are 7 output formats available in the program, and MP3 or M4A will be a good choice for any iPod Touch. MP3 is default output format and you can choose 320kbps in the profile list for lossless conversion. If you like M4A better, choose M4A in the output format list and choose 256kbps in profile list for lossless conversion. 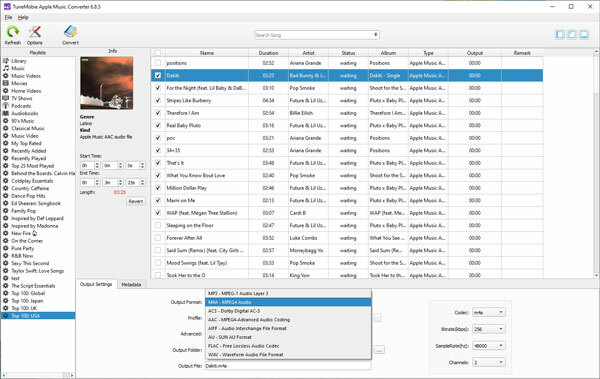 If necessary, set output folder for your songs, and click Options button to adjust conversion speed and set custom file names by ID tags and characters. Now you can exit TuneMobie Apple Music Converter and iTunes. Then restart iTunes and add the converted Apple Music tracks to iTunes library. As output MP3/M4A files preserve ID tags, they may look the same as original Apple Music tracks. We recommend you delete the Apple Music tracks or playlists which have been converted. And you can add them back to your iTunes library later. Connect your iPod Touch with USB cable, create a playlist to include all the converted Apple Music tracks, then sync to the device. If you don't want to use iTunes or delete original Apple Music songs, you can try some iPod transfer software programs which can help you transfer MP3/M4A songs from computer to iPod Touch directly without running iTunes. After transferring converted Apple Music songs to iPod Touch, you can enjoy them on the go without any limitation.